Gajah Mada is one Patih, then Mahapatih, who delivered the Majapahit Majapahit to the top of success. Unknown historical sources about when and where Gajah Mada birth. He began his career in the Majapahit as bekel. As I have to save Prabu Jayanagara (1309-1328) and overcome the rebellion Ra Kuti, he was appointed as Patih Kahuripan in 1319. Two years later he was appointed as Patih Kediri. In the year 1329, ie Majapahit Patih Aryo cistern (Mpu Krewes) wants to step down from office. It pointed Patih Gajah Mada from Kediri as his successor. Gajah Mada own governor indirectly accept. It wants to make the service before the Majapahit conquered Sadeng Keta and the moment are doing pemberotakan of Majapahit. Keta & Sadeng were finally subdued. Gajah Mada governor then officially appointed by the Queen Tribhuwanatunggadewi as governor of Majapahit (1334). At the time of adoption it say Palapa Oath, that it will just enjoy palapa or spices if interpreted worldly pleasures have successfully conquered the archipelago. As shown in the following Pararaton book : "Sira Gajah Mada pepatih amungkubumi ton swing amukti palapa, sira Gajah Mada: although huwus lost archipelago ingsun amukti palapa, although defeated Desert ring, ring Horror, Tanjungpura, Haru ring, ring Pahang, Dompo , ring Bali, Sunda, Palembang, Tumasik, Samana ingsun amukti palapa "
Although there are a number (or even many) people who doubted his oath, Gajah Mada Patih was almost successful conquer the archipelago. Bedahulu (Bali) and Lombok (1343), Palembang, Swarnabhumi (Sriwijaya), Tamiang, Samudra Pasai, and other states in Swarnadwipa (Sumatra) has been conquered. Then Bintan Island, Tumasik (Singapore), Malay Peninsula, and a number of states in Kalimantan as Kapuas, Hulu, Sampit, Kotalingga (Tanjunglingga), Kotawaringin, Sambas, Lawai, Kandangan, hedgehogs, Samadang, Tirem, Sedu, Brunei, Kalka, Saludung , fifty, Sand, Barito, Sawaku, Tabalung, Tanjungkutei, and Malano. In the reign of Hayam Wuruk Prabu (1350-1389) which replaces Tribhuwanatunggadewi, Patih Gajah Mada continue to expand as the conquest of the eastern provinces Logajah, Desert, Breadfruit, Taliwung, Cow, volcanics, Horror, Hutankadali, Sasak, Bantayan, Luwuk, Makassar, Buton , Banggai, Saffron, Galiyan, Salayar, Sumba, Muar (Saparua), Solor, Milky, Wandan (Banda), Ambon, Wanin, serán, Timor, and Dompo. In the Song of Sunda  described that Bubat War (1357) begins when Prabu Hayam Wuruk daughter to marry Dyah Pitaloka Sunda as queen. Prabu proposal accepted by the Government Hayam Wuruk Sunda, and the crowds came to Majapahit Kingdom Sunda to the general getting married. Gajah Mada who want Sunda subject, forcing want Dyah Pitaloka as an admission presentation Majapahit power. Due to the Sunda rejection of this matter, there was a disproportionate battle between teams and groups of Majapahit in Bubat Sunda; that moment become Sunda group accommodation. Dyah Pitaloka suicide after his father and all his companions fall in battle. A result of the incident, Gajah Mada Patih disabled from his department. In Nagarakretagama told a slightly different case. It is said that Hayam Wuruk very appreciative Gajah Mada as a hero General Mahamantri, wisdom, and faithful to serve the country. The king awarded hamlet "Madakaripura" scenic in Tongas, Probolinggo, to Gajah Mada. 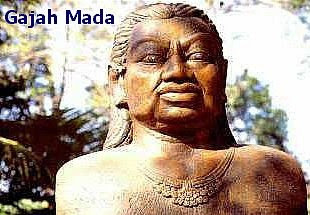 There opinion stating that in 1359, Gajah Mada reappointed as governor, just only it ruled from Madakaripura. Mentioned in Negarakretagama that Hayam Wuruk return from religious ceremonies in Simping, it found that Gajah Mada was ill (sick). Gajah Mada mentioned died in 1286 Saka or 1364 AD. Hayam Wuruk then choose six Mahamantri General, to further assist in maintaining the country's affairs.